Buffalos roam the earth (and the stage) for a long time. This one does it with a Gibson Les Paul and a humongous Marshall stack. Or ten. Here’s the cover of a new “unofficial” two-disc set documenting Neil Young and Crazy Horse’s blazing “Ragged Glory” tour of 1991. 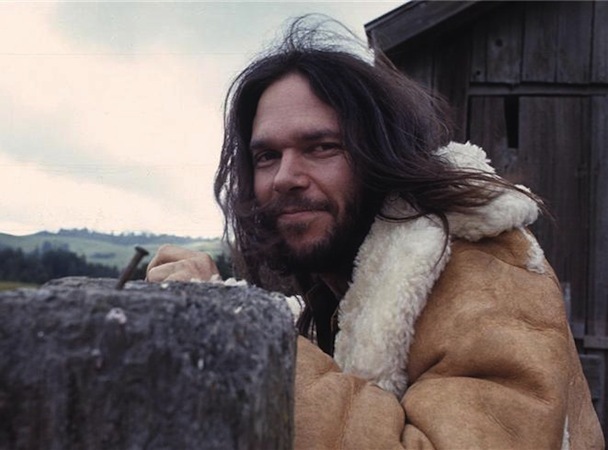 It gets cold in Canada: Neil Young in the 1970s. Neil Young rolls another number. 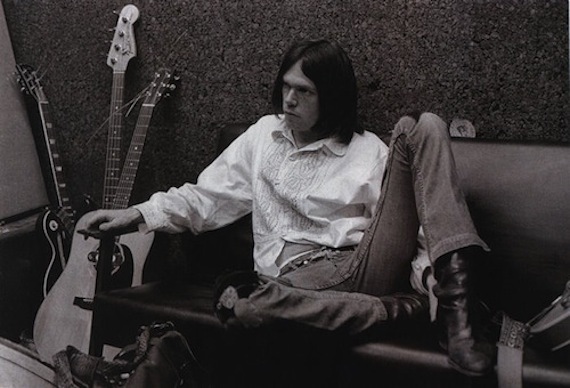 The Old Man as a Young Man: Neil Young, circa 1970. Like an electric guitar getting too close to an amplifier and triggering a squall of feedback, today’s time at the writing desk proved a happy accident. I did not even realize it was the great Neil Young’s birthday today when I finally sat down to write a long-promised (to me, at least) review of a terrific new “unofficial” Neil Young CD release for the excellent Collectors Music Reviews website and blog that I contribute to. Anyway, the upshot to the afternoon is that I had some rare leisure hours to listen to (okay, blast at maximum volume is more like it) this “Ragged Glory” tour memento four or five times in a row as I wrote, and then published, my review just in the nick of deadline (in other words, seven minutes before I had to pick up my daughter at day care). Neil Young, who has been making music for five decades now, is a timeless but always timely marvel; a man for all seasons, styles, genres, and moods — and easily one of my favorite artists of all-time for numerous reasons (a few which I’ve attempted to outline below; but hell, if I had realized it was old man Neil’s birthday, I might have run off at the mouth even more … probably just as well that I didn’t). This will have to do for a hasty, but hopefully tasty, birthday tribute. DISC TWO (65:07): Love And Only Love, Rockin’ In The Free World, Encore, Campaigner, Welfare Mothers, Like a Hurricane SOUNDCHECK BEFORE THE CONCERT: Gone Dead Train, Love To Burn, Guitar Riffs, Country Home, Over and Over. The humming you heard in your head when Neil Young and Crazy Horse embarked on their 1991 tour in support of “Ragged Glory” could be attributable to a few things: Neil and the Horse plugging into their massive Marshall stacks; Neil and the Horse jamming at full volume through those behemoth amps; or the tinitus-inducing blown eardrums that lingered, some fans swore, for months and years afterward. But there was also the buzz beforehand, when Young announced that he would once again be taking his trusty Crazy Horse on the road, and also bringing a pair of younger, decibel-loving acts with him to warm up the audience’s ears (or scorch them): the roots-punk swashbucklers Social Distortion, and the alternative post-punk pioneers Sonic Youth. Neil chose wisely. Both the “Ragged Glory” album and tour were meant to be monuments to the glory (ragged and otherwise) of noise, feedback, distortion, and, at the heart of it all, the wild, woolly spirit of unhinged rock & roll. Reportedly, all but one of Young’s 50-plus shows for “Ragged Glory” were recorded for posterity, and presumably, for the double live album, “Weld,” that followed a year later (along with a bonus disc, called ‘Arc,” which consisted of an album’s length collage of feedback and rolling waves of distortion and guitar sustain; never let it be said that Neil Young does anything half-assed). The dedication to documenting Young and Crazy Horse in all of their “Ragged Glory” live and on the road comes as great news for fans of this period. Beginning with “Freedom” from the previous year, it’s an era that revitalized and re-energized the singer-songwriter, and renewed Young’s sense of mission and purpose. “Buffalo Campaigner,” therefore, is a huge, satiating treat for fans famished for a high quality recording of this tour; appetizer, dinner, and dessert rolled into one sitting. Out of the slew of recent unofficially released Young live recordings and titles that have hit the collector’s market over the past few months – a number of which likely originally began life as Wolfgang’s Vault website downloads – “Buffalo Campaigner” (whose subtitle on the back reads “Weld Outtakes”) is surely one of the best and most essential. Issued on factory pressed silver discs by a no-name mystery label (the only identifier here is the catalog number: NYCH-21691, with the acronym letters being self-evident), this powerhouse release documenting a February 16, 1991 show at Memorial Auditorium in Buffalo, New York, looks as good as it sounds (and by good I mean great). Besides the professionally screened picture disc art, the release includes full-color front, inlay, and back cover artwork featuring era-correct photographs and a track list typeset that makes it virtually indistinguishable from the official “Weld” release from which it springs. But this dressing is all really just the proverbial icing on a many layered cake made of meat, heat, muscle, heart, blood, guts, and precious little fat. 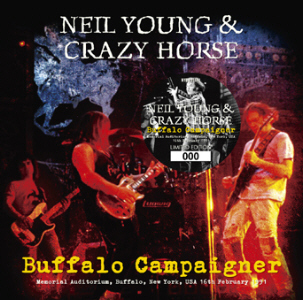 “Buffalo Campaigner” presents us with a magnificent stereo soundboard recording of the complete show, featuring a balanced, vividly clear mix that listeners will immediately associate with Young’s classic live albums: Young’s and Frank Sampedro’s electric guitars crunch and crash; the crackle of feedback and amplifier hum echoes at the edges; the meaty rhythm section of bassist Billy Talbot and drummer Ralph Molina drives the locomotive along the tracks; and Neil’s keening vocal howls in the maelstrom; the head and heart of the beast. Also included as a bonus on disc two is a five-track, pre-show soundcheck, recorded in the same superb quality, that includes a Crazy Horse song sans Young, “Gone Dead Train,” and two songs from “Ragged Glory” not performed that night: “Country Home” and “Over and Over.” While not essential to the quality of this release, the bonus cuts make for a nice addendum for completists and the curious. Overall, on its own and as an unofficial companion piece to “Weld,” “Buffalo Campaigner” succeeds and beautifully. The show opens with a recording by one of Neil’s peers and idols, Jimi Hendrix, whose war-torn and iconic recording of “The Star Spangled Banner” sets the stage for the raw, soul-baring personal and political anthems to come (with Young, it’s always a blurry, bleary blend of the two). “Hey Hey, My My (Into The Black)” kicks things off (in a video of this show, Neil is seen wearing an Elvis Presley-emblazoned T-shirt while he sings the line “The King is gone / But he’s not forgotten”). And before long, a majestic reading of Bob Dylan’s ‘Blowin’ In The Wind” hits with the kind of wallop to one’s humanity and consciousness that the lyrics call for. The backdrop to this concert and tour at the time, of course, was the U.S.’s involvement in the 1991 Persian Gulf War (as well as who knows how many other covert military operations), so the timing and potency of the material is at a premium. Here, as he did two decades earlier with Richard Nixon, Young namechecks then-President George H.W. Bush on “Campaigner,” and offers implicit forgiveness by claiming that “even George Bush has got soul.” (Alas, that sentiment and gesture was and is, for some of us familiar with the Bush Administration’s hawkish polices on a number of fronts, unconvincing at best). The four “Ragged Glory” tracks Neil and Crazy Horse toss into their blistering blender – “F*!#in’ Up!”; “Love To Burn”; “Love and Only Love”; and “Mansion On The Hill” – mix well with the sustained feeling and mood of ferocious freedom on display. A searing, scathing “Rockin’ In The Free World” closes the set pre-encore set as a devastatingly pointed, perfect distillation of one of Young’s most enduring subjects as a songwriter: the scarred, lost, and lonely souls who struggle to survive amid a violently cruel or callously indifferent world. It can never really be a free world that we live (or rock) in, as long as heartlessness and a lack of humanity exists, some of Neil’s best and most heart-wrenching songs seem to say. We are either blind or kidding ourselves, or we simply don’t want to hear the truth. Maybe finally, that’s why Neil and Crazy Horse keep turning the sound up and up and higher still. On “Buffalo Campaigner,” they reach for a mighty volume that’s impossible to ignore. Great story! Does exactly what it should: make me want to break out every Neil Young album I’ve got and play them all weekend. 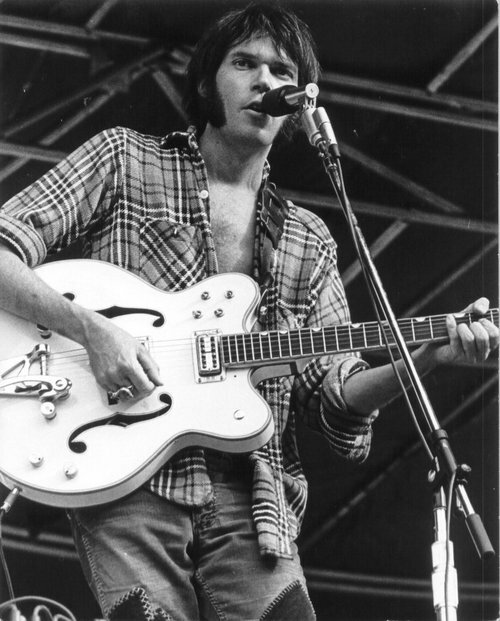 Roll another number for the road: Hey, let’s make it seventy, which is what birthday boy Neil Young hits today. That numeral is pretty significant, both as a marker of age and (I like to hope) progress, and the musically fertile decade that it represents. In Neil Young’s case, the ’70s were very, very good to him (and he was very, very good to them) in a creative and commercial, if not always personal, sense. He lost two friends and co-conspirators, guitarist Danny Whitten and roadie Bruce Berry, to drug addiction and fatal overdoses during the early part of the decade, and their spectral presence — and that of loss itself — continues to haunt and inform his music. in fact, his darkly devastating work, “Tonight’s The Night,” was so claustrophobically mournful that it wasn’t released by his record company until 1975 — two years after it was recorded, and even then only reluctantly after pressure from Young. The album dealt both explicitly and implicitly with those deaths, against a pervasive, shrouding backdrop of dread and loss in general. Though it received mixed reviews at the time and wasn’t a commercial blockbuster, Young has been quoted as claiming that “Tonight’s The Night” is the closest he’s ever come to making “art.” The work, of course, has since come to be regarded as a pivotal masterpiece and a benchmark in Young’s long and prolific career. Rather than stifle or paralyze him, tragedy and grief seemed to fuel Young — perhaps in part due to his having successfully exorcised, or exhausted, his emotional demons. Young released an album for every year of that decade (he again matched that total in the ’80s) — a clip that seems almost unfathomable by a major artist now — and he also wrote and recorded much more that went unissued. That total doesn’t count the occasional times he re-grouped with some or all of his old cohorts in Crosby, Stills, and Nash — or the two solo albums he made in rapid succession — ’68’s self-titled solo shot and ’69’s epochal “Everybody Knows This Is Nowhere” — before the close of the Sixties. He was all of 24 as 1969 gave way to 1970, and he was right: There was so much more to come. These days, Young is as busy as ever, with a telephone-book sized autobiography in the can (and another allegedly on the way). He’s roared through myriad styles and sub-genres, alienated and annoyed at least one record company, and released 13 albums in the last 15 years alone (35 total). 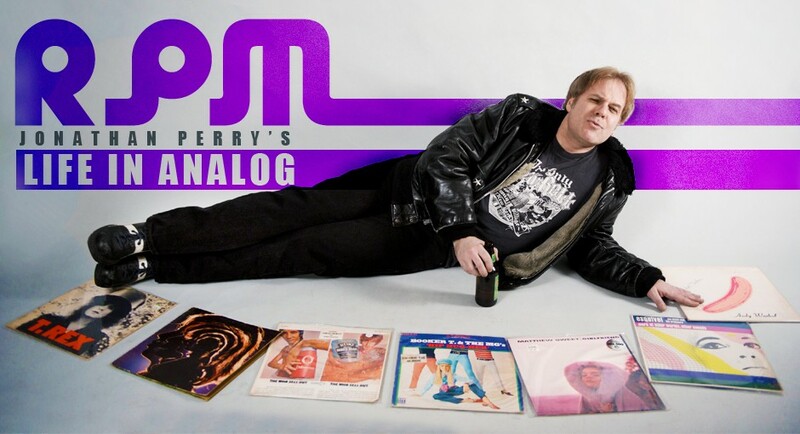 Then there’s his ongoing, endless “Archives” multi-media music project entailing the unearthing of a lifetime’s worth of tapes, recordings, tangents, demos, and detours of his massive back catalog. Never obvious, easy, or lazy, Young remains a restlessly, and relentlessly, creative artist who continues to confound and conspire, illuminate and obfuscate, as well as vex and endear, but mostly inspire, his fiercely devoted fan base. In short, he always keeps moving, through intuition rather than calculation, and rolling another number for the road (whether physical or spiritual) to keep himself — and us — going. Which, to me at least, is exactly what an artist, especially one named “young,” is supposed to do.